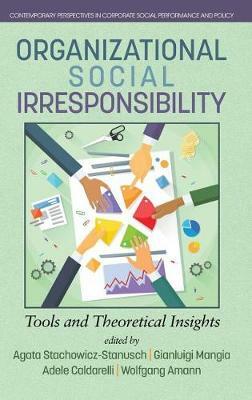 In the book Organizational Social Irresponsibility: tools and theoretical insights we focus both on theoretical and practical aspects of organizational social irresponsibility and hope to provide a contribution to the contemporary state of knowledge about its causes and results. The book is divided into three parts: first titled "Organizational Social Irresponsibility: Practices and experiences", second: "The thousand faces of dark side of business" and third: "Social, cultural and institutional dimensions". The book is written by a range of authors from all over the world. They provide us with examples of some irregularity in social organizational activity. There were included some theoretical and practical contributions into the topic of organizational social irresponsibility, from different sectors (e.g. pharmaceutical or manufacturing industry as well as public administration) and various organizational processes (such as marketing, training, innovation and knowledge management). We hope it will be a worthy inspiration for struggling with dark sides of organizational existence.